The core of this week’s plot was the capture and low-key torture of Caroline. I say “low-key” not because it looked painless (it didn’t) but because there was a relative lack of screaming and very few “Noooooo!”s. It felt very pro forma for both the torturers and torturee. The most interesting part of Caroline’s capture may have been the way in which information was exchanged. Stefan has a plan and Damon is bored enough to get in on it. Damon takes a while to tell Bonnie, doing the whole “I know what’s best for you” thing that, reasonably, drives her crazy. Bonnie goes to Matt, who really got the short end of the stick this week and decides to blame Damon for it. It's the Mystic Falls version of the game of telephone. And there is trouble among the Heretics, who fight about clothes and use eyeliner pencils as weapons. (Typing that sentence makes me realize yet again how little I like them.) Enzo is a pawn in their game, as is the deed to the Salvatore house. This week’s most exciting sequence—Stefan pushed out of his old home—was caused by a real-estate transaction. Meanwhile, Ric’s quest to reanimate Jo was touching and, I hope, promises to turn into something suspenseful soon. The Phoenix stone is an interesting McGuffin: it is magic, but the magic was cloaked. Thank goodness Bonnie is the best witch in the world. My initial impression of this episode—confirmed by my rewatch—was that very little happened. The first time through, I was distinctly bored; on my second watch I was able to appreciate the amount of work this episode did in order to set up conflicts and plot points. Like: the Phoenix stone. The loss of Elena. The Heretic infighting and Enzo’s continual ambiguity. The missing sixth Heretic. Stefan's relationship with Valerie. There’s a lot to work with there. I hope TVD starts to do that work soon, though, since this fast-paced show is starting to feel like a slow, slow burn. I do still love the flashforward stuff. 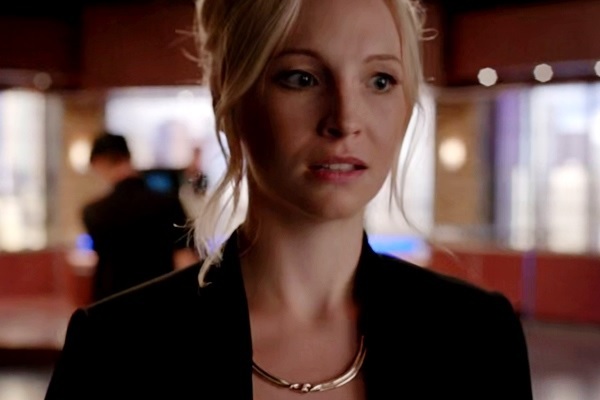 This week, we got Caroline as a producer (I would have guessed politics) who can’t go back to Mystic Falls. And she’s engaged! I wonder who it is. And who the adversary is, too. Jo, maybe? • I could have done without the found-footage opening. It’s an interesting approach, and found footage always freaks me out, but the shift from the flashforward to the found footage to the actual show was a bit too much for a five-minute opener. • I did sort of like that the Salvatore house now has a housekeeper. Do you think Stefan and Damon would swap who had toilet-cleaning duties? • The original version of the film Never Let Me Go had a horrifying sequence that shows what happens to a vampire when their permission to be in a home is revoked. But TVD’s version is more reminiscent of True Blood, isn’t it? • Mama Salvatore is truly the worst mother in the history of the world. "Reminiscent of True Blood" is a charitable way to put it. Sort of the way having flashforwards to three years later is "reminiscent of" the fourth season of LOST. I'm totally cool with TVD stealing a page from the book of Lost. I love Lost. "The original version of the film Never Let Me Go had a horrifying sequence that shows what happens to a vampire when their permission to be in a home is revoked. But TVD’s version is more reminiscent of True Blood, isn’t it?" Fun fact: hydrofluoric acid wouldn't do pretty much anything to that stone, because it is one of the weakest acids out there. It would have dissolved that glass beaker it was in, though. Get your facts right, showrunners!